Service-oriented cloud-edge integration is a promising approach for the big IoT stream processing effectively in a distributed manner. Dynamic adaptation of cloud and edge service is of key importance to enable the seamless integration of cloud infrastructure and edge equipment. There exist several challenges, such as grasping the right moment and coping incomplete matching. 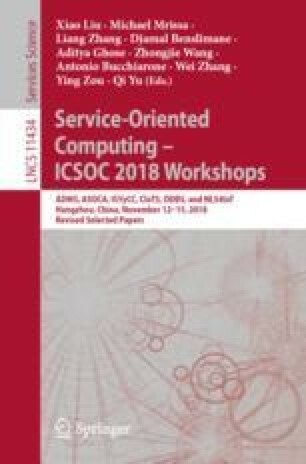 Targeting at the challenges and based on our previous proactive data service model, the paper proposes a service adaptation approach, called as ALES, to enable the dynamic cloud-edge integration. The main contributions include: transforming the service adaptation problem into the improved maximal weight matching model in a dynamic bipartite graph. The M/M/c/∞ model in the queuing theory is modified to optimize the Kuhn-Munkres algorithm to minimize the average response time of the request of edge service. The effectiveness of the proposed approach is demonstrated by examining real cases of Chinese State Power Grid. Experimental results verify the effectiveness and efficiency of our approach. This work was supported in part by a grant from the Technology Project of State Grid, “Research and Application of Key Technology in Big Data Analysis of Power Quality”, the National Natural Science Foundation of China (Grant No. 61672042), the Program for Youth Backbone Individual, and the Beijing Municipal Party Committee Organization Department (Grant No. 2015000020124G024).